The #cetis14 conference at the University of Bolton has been a great success. Although run on a self-funding basis for the first time (and consequently using the facilities of its home institution for the first time), it still attracted 100 delegates from the UK HE and FE sectors eager to talk about the impact of interoperability, cloud computing, e-books, systems integration and learning analytics. If anything, the conversation has been more eager, imaginative and focused than in previous year. Next month sees Cetis involvement with another profile event: the annual Institutional Web Management Workshop (IWMW). This event was established in 1997 and has been held every years since then, with the forthcoming IWMW 2014 event being the 18th in the series. The event was established by Brian Kelly in his role as UK Web Focus at UKOLN. Following the cessation of Jisc funding for UKOLN the majority of UKOLN staff were made redundant. However Brian subsequently was appointed as Innovation Advocate at Cetis. In light of the feedback received at the IWMW 2013 event it was clear that there was a strong wish for the event to continue. This year’s event is being provided by Brian, Cetis and Netskills and will be held at Northumbria University on 16-18th July. In common with the Cetis conference series, IWMW events have always provided a forum for members of the community to discuss technological developments, ask questions and share best practices – the event is called a ‘workshop’ and not a conference in order to emphasis the importance of the workshop sessions in which all participants are encouraged to actively participate. There are also plenary talks, which provide an opportunity to motivate – and perhaps even challenge – the audience as well as share insights into approaches being taken across the sector in web development activities. We had been told that the event would benefit from talks by charismatic speakers with a proven track record of delivering talks at prestigious national and international events. Since it had also been suggested that we should look for insights from outside the higher educational sector the opening session, Perspectives from Outside, provides the opportunity to hear the opening talk from Tracy Playle, founder of HE Comms, an online social network for Higher Education communications and marketing professionals who regularly speaks at conferences and seminars in the UK, mainland Europe, North America, Asia and Australia. Tracy will share her reasons “Why you don’t need a social media plan and how to create one anyway”. The other plenary talks on the opening day are provided by two regular speakers at IWMW who, based on the feedback we’re received, are always successful in stimulating discussion and debate. Paul Boag has been working with the web since 1994. He is now co-founder of the digital agency Headscape, where he works closely with clients to establish their web strategy. Paul also speaks extensively on various aspects of web design both at conferences across the world and on his award winning web design podcast boagworld. Paul will give a plenary talk on “Digital Adaptation: Time to Untie Your Hands“. Ranjit Sidhu (or Sid) is founder of statistics into Decisions (also known as SiD!). Ranjit has worked at several Internet based companies, but has found his niche in analysis and helping clients understand what is going on in the internet ether and how to use that information to improve what they do. 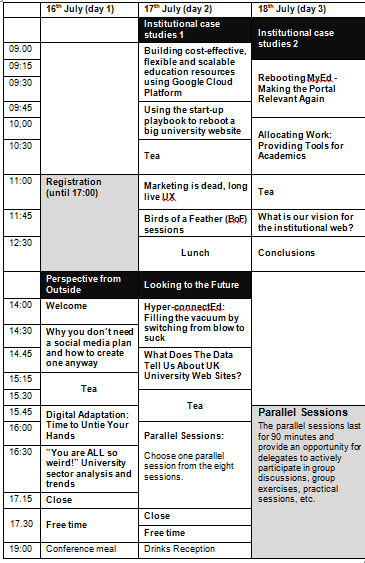 Ranjit, who is currently working with 15 UK universities, will give a plenary talk on “‘You are ALL so weird!’ University sector analysis and trends”. This year’s workshop sessions cover a range of areas including the usability (“Making Personas Work”), content (“Reframing Content Strategy” and “Learning to COPE – Create, Once, Publish Everywhere”), metrics (“Google Analytics For Beginners”) and technical sessions on “Rapid Development: Analytics reporting powered by Google Apps Scripts”, “Working with data.ac.uk: Creating your Institution’s OPD (Organisational Profile Document)”, “WordPress as a CMS” and “How to Buy Free Software”. As well as these workshop sessions we will also be providing an opportunity for participants to organise their own birds-of-a-feather sessions. We are very aware of reductions in staff development budgets which institutions may now be facing. The feedback received at last year’s event showed that participants were very aware that the event did provide value-for-money, with a recognition that if the cessation of Jisc funding necessitated an increase in the cost of attendance this would be understandable. Thanks to the kind financial support from our sponsors we have been able to keep the cost of attendance at the event down to the same price as last year. Indeed as shown in Table 1 we have kept that price at the same level over the past five years, with the exception of 2011 when the event was reduced to a 2-day event. In addition to the support of our sponsors we have been able to keep the prices down to a very affordable level due to the willingness of the speakers and facilitators to provide their sessions for free, in order to support the community. Still Time to Book a Place! 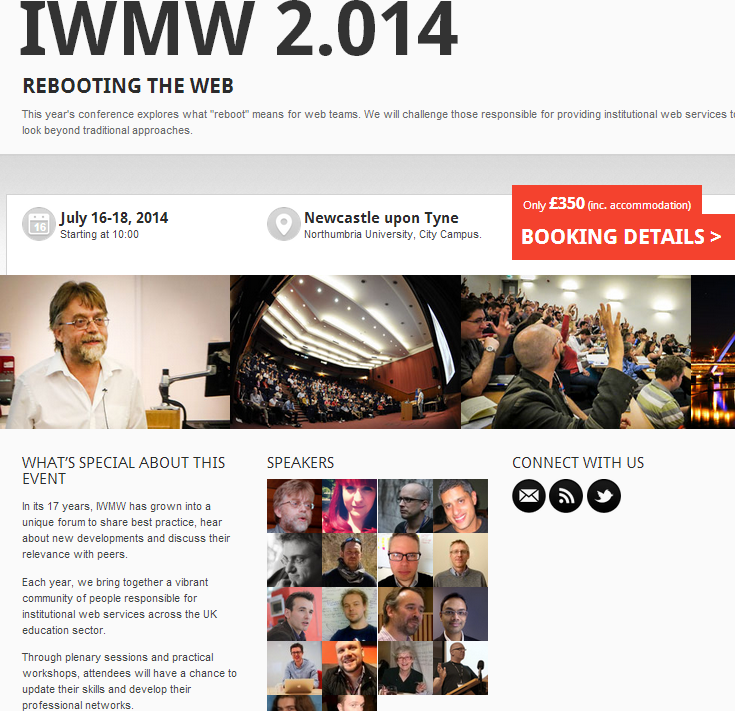 The official closing date for bookings for the IWMW 2014 is Friday 4 July. If you’d like to attend please visit the online booking page.